Below are the types of bottled water available on the market today. You will read for yourself that not all bottled waters meet the distinction of pristine water. Distilled water is water that has been purified by distillation. The mechanics of the process use a rapid high-temperature environment to separate out the solids and draw off the water as steam and then condense it back to its liquid form. The process does produce a very pure water which meets standards setup in the United States Pharmacopeia, 23rd Revision, January 1, 1995. Part of this specifies that the water contain no more than 10 ppm of total dissolved solids. In the distillation process ions are stripped from the water molecule in a violent manner in contrast to the gentle heat evaporation in nature. This leaves "holes" in the molecular structure and the water becomes "aggressive". It waits to complete its structure by filling in the "holes". Distilled water is thus an ideal water for cleansing, colonics, etc. because it binds with and pulls "junk" out of our systems. Unfortunately it does not discriminate, and naturopathic doctors will tell you that it pulls the central minerals from your body as well. Spring waters are derived from an underground formation from which water flows naturally to the surface of the earth. Many factors, both natural and manmade, influence the purity levels of a spring. The composition of the soil and rocks may add naturally occurring but unwanted substances to the water, i.e. radon, fluoride. Many of the treatment processes used to produce purified water cannot be used to treat spring water as they would change the characteristics of the water and it could no longer be labeled spring water. Many people choose spring water because they hope to get minerals their body needs. The minerals in spring water come from rocks and are inorganic in form. Our body cannot process them. When the plants take in these waters through their root system they transform them to an organic form - something our body can process - which is why we really do need to eat our fruits and veggies! Mineral water by definitions setup by the Texas Department of Health Manufactured Foods Division contain no less than 250 ppm total of dissolved solids coming from a source tapped at one or more bore holes or springs originating from a geologically or physically protected underground water source. No minerals may be added to this water. The minerals in these waters have been dissolved by water leaching as it flows over and through beds of sediment and rock. These minerals are inorganic in form and not soluble in the human body and more likely end up as a buildup of deposits in our system. We should be getting our minerals through the foods we eat, but studies have shown that even eating all organic foods doesn't ensure we obtain all the necessary elements for optimal health. If the soils we are growing our organic foods in are depleted then obviously our diets will be as well. It is necessary to take supplements in many cases. Trace mineral supplements can be purchased at a health food store. 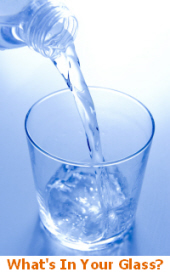 Purified water is water that has been produced by one of the following processes: distillation, deionization, reverse osmosis or other suitable processes which ensure the purity levels are no greater than 10 ppm as stipulated by the United States Pharmacopeia, 23rd Revision, January 1, 1995. Water produced by these methods is process oriented and not source dependent. The source could be a well, spring, municipal supply etc. as the process ensures the purity of the finished product. Rain Fresh® Water has a unique feature which is the addition of food grade oxygen. Dr. Carl Baugh at the Creation Evidences Museum in Glenrose, Texas, has developed a creation model of the universe which agrees with the Bible and fossil records he has uncovered in his work as a researcher and archeologist. Dr. Baugh called Rain Fresh® after buying some water at the health food store to inform us that we were making "creation" water. The amount of oxygen we were stabilizing in the water would have been the amount which he believed water contained in the days before the Genesis flood. We were very excited to hear this as this was exactly what we were attempting to do in duplicating the hydrological cycle - make the water God intended for us to drink. We are sure you will agree, when it comes to making a choice for bottled water, Rain Fresh® Water is the best choice you can make!